The well known “Occupy Movements” that become a household name this year have yet again appeared, but this time with The Walking Dead as “Occupy Atlanta”. There has been some recent tee shirt designs that have taken on the movement as well as incorporated the hit AMC series, The Walking Dead. 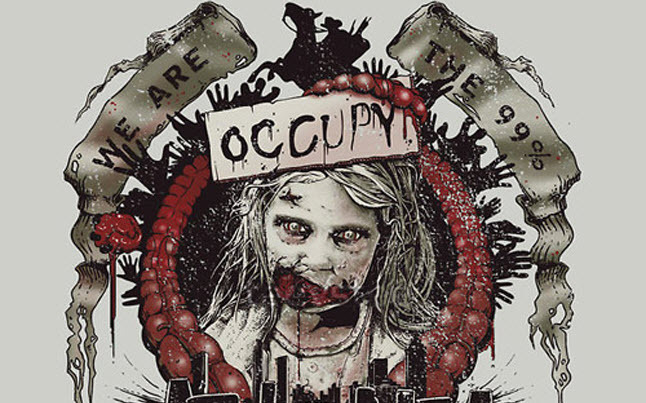 The tee shirt designs have an “Occupy Atlanta” feel, and feature the girl that became well known in the first episode of the series. In the first episode, “Days Gone Bye”, Rick encounters a little girl at a gas station who is lost and happens to be a zombie. The remarkable thing is she is holding a teddy bear which seems to mean that she still has a slight remembrance of who she once was. In the end, the zombie girl charges at Rick and he has no other choice but to put her down. This girl is featured on the “Occupy Atlanta” tee shirt. While there are many good zombie and Walking Dead tee shirts out there, this one is clever because it brings in the news that flooded our television screens. I mean who wouldn’t want to wear The Walking Dead Occupy Atlanta tee?